The group shot at Hanover Park Vineyard at last year’s #NCWine Bloggers Summit. 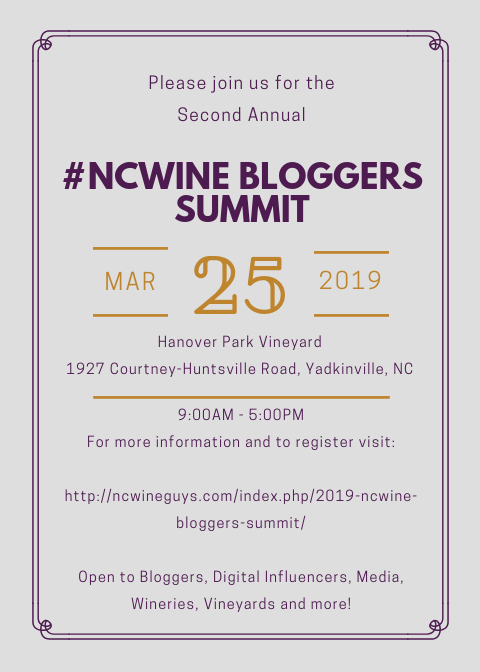 The Second Annual #NCWine Bloggers Summit will be held on Monday, March 25, 2019 at the Studio at Hanover Park Vineyard in Yadkinville, NC. Registration runs from Saturday, January 5, 2019 to Monday, March 18, 2019. Cost is $25 per person which includes lunch. There is one ticket type for Bloggers/Digital Influencers/Media. There is another ticket type for Wineries/Vineyards/General. Please choose the appropriate ticket type. On Sunday, March 24, 2019, there will be a wine tour for bloggers/digital influencers/media. Details are still being finalized. We hope to have this information by February 10, 2019. There will be separate registration for this tour. To register for the summit, go here: https://www.brownpapertickets.com/event/4033588. For those traveling and needing accommodations, a room block has been reserved at the Fairfield Inn in Elkin, NC. The rate is $105 / night. This rate is available from Saturday, March 23, 2019 to Tuesday, March 26, 2019. You must book by February 23, 2019. Use code NCWS when booking by phone or online. Should you have issues online, please call the hotel. Lunch – Participating Wineries are invited to bring wines to share.